Your Commonage .ie: The Beef Industry and the Management of Uplands. 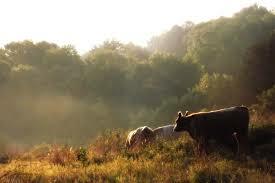 The beef industry as it currently operates does not serve the needs of those farming Irelands uplands and commonages. Beef production throughout Ireland operates on very tight margins. Beef enterprises operate on a knife edge and their finances can easily be thrown into chaos, extreme weather, the cost of inputs, low prices make life difficult for everyone in that industry. However suckler farmers in Irelands uplands and particularly those on commonages face added challenges. Like other suckler farmers, these farms are largely dependent on direct payments. The added difficulty here is maintaining the eligibility of hill pastures for payments. While the situation in this regard has eased considerably in recent months, farmers will always face the challenge of demonstrating that farming activity is occurring on hill sites. Passing the utilisation test is a particular problem in situations where past management driven by the policies promoted at the time has led to the dominance of a single plant species. In spite of the focus on it during the debate on the future of commonages heather is not the real problem. A much greater difficulty is dealing with Molinia caerula or Purple Moor Grass as it is commonly known. This deciduous grass grows rapidly in early summer but its palatability for stock is limited. Sheep will only eat it if fenced in and deprived of alternatives, cattle and horses will graze on it in early summer, but by August it has gone over and is largely avoided by stock if alternatives are present. The risk arises if the management regime is such that large grazing animals are absent in early summer. On many farms, cows are kept on the enclosed land when the calves are young and their introduction to the commonage is too late in the season for Molinia to be utilised. When this occurs cattle may concentrate on other parts of the site and largely avoid the wet heaths where Molinia dominates. This creates a very real risk that such areas could be deemed to ineligible for payments due to the absence of agricultural activity. In short they fail the utilisation test. In many cases a finding of ineligibility like this and the ensuing penalties could destabilise the finances of the entire farm. Molinia dominance is not only a risk to the agricultural value of heathlands but also to the biodiversity value. Molinia is a fire adapted plant. The dead leaves from last years growth are the fuel that feeds many of the big bog fires that we see every spring. These fires threaten property, threaten livelihoods, damage our natural heritage and the smoke releases carbon back into the atmosphere. By doing this they undo the potential for carbon sequestration. How does all of this link into the beef industry you may ask. The answer is very clear. The demands for a certain type of product has had a dramatic impact on the herd profiles of suckler operations in hill farming areas. Ever since the BSE crisis the demand has been for younger beef. Animals are slaughtered at 30 months or younger. The processing industry continues to consolidate into an ever smaller number of operators and the options for a specialist product continue to narrow. Those involved in finishing animals have quite naturally responded to this by demanding calves that can be finished by the age demanded by processors and big retail chains. All of this mitigates against traditional breeds and encourages the increasing dominance of continental breeds and demands calves be sold before the first winter. For some this is seen as progress and perhaps on lowland farms it is. But on small suckler farms in hill areas, the effect is very disruptive. It is at odds with the effective management of these lands for agriculture, for conservation and for efforts to address climate change and improve landscape resilience. Vegetation on the hills is difficult to digest, even during its period of peak palatability. Molinia is a forage plant;best exploited by older animals. Unfortunately the demand for younger beef has meant that these older animals are often in short supply during the critical months of June and July when grazing down Molinia is achieveable. In the past many of these farmers would have kept animals for two winters, this pattern is a thing of the past. The demand for younger beef and the price penalties put on older stock means that calves are sold before the first winter. Even the cows are kept on the enclosed land until late summer when the calves are a bit stronger. The result, is that barring replacement heifers and the odd dry cow there is nothing available to graze Molinia down in June and July. Even these are present in such small numbers that it is often more practical to keep them at home rather than turn them out on the hill. The outcome is that Molinia goes ungrazed, it gets stronger and its dominance of the site increases (as does the risk of an ineligibility finding). Attempts to address this by burning only make the situation worse by killing off competing vegetation. Agri environment schemes such as GLAS can make a contribution but what is really needed is a worthwhile outlet for older beef, preferably from hardier traditional breeds such as the Aberdeen Angus, Galloway, or Herefords. If animals could be kept on the farm until the age of 2 or 3, the means to manage a Molinia problem would be available and the farmer better placed to protect his direct payments. Interestingly farmers in the Basque Country are producing older beef (including that from retired dairy cows). This is being done on upland pastures with animals that would be rejected by the beef industry here. They are producing a premium product, their richly marbled beef is commanding a premium price in restaurants both in Spain and abroad. (For more information follow the link at the bottom of this article). The longer I have worked in Irelands uplands, the more convinced I am that the individual aspects of managing the hills cannot be looked at in isolation from each other. Sustainable agriculture, the rural economy, conservation grazing, the management of water resources and the protection of our natural heritage are not mutually exclusive. In fact the opposite is true. To achieve any degree of success in any one of those fields requires that consideration be given to them all. Managing uplands effectively, needs grazing by suitable livestock, delivering this grazing needs farmers, farmers need to be able to get a decent price for their produce. To achieve this we need an outlet for older stock, the promotion of beef from farms engaged in conservation grazing, shorter distribution chains and the continued survival of the remaining small abattoirs. Hill farming is a small part of the overall beef industry but it is not well served by it. Change is needed. The next generation aren't going to stick around to farm in these areas unless there is a return equal to other jobs in larger towns and cities and the hill land and farming heritage along with a lot of rare animal species will be abandoned and lost.